Tonight we begin the final block of movies in Project Horror, The Evil Men Do. If there's one group of movies that I fully expect will unsettle me, this is probably it. The great Del Close is far more closely associated with comedy than with horror (though he was in the remake of The Blob), but he's got a quote that I really like about the comparison of art and life. "It's a grim business, this being funny. Every time you come up with a strong satiric idea, the world tops it. None of our reactionary military characters in the past decade could top the real-life line that came out of Vietnam: 'We had to destroy the village in order to save it.'" It's easy to write off spook films about vampires or zombies, because as frightening as they may be, we all know that the things in them can't touch us in real life. Depending on where you come down on spiritual matters, movies about the occult and supernatural may have more impact, which is why I think The Exorcist still tops so many lists of the scariest movies ever made. But when you think about the actual horrors that people visit upon each other every day, right now... At best it makes the movies pale in comparison, at worst it means that our movies are aestheticizing the violence around us to the point that we don't notice it anymore. I'm rambling a little bit here, and I know that a lot of it has to do with context and my own hypocrisy - the same stuff that I cover my eyes for in a Pasolini film, I cheer for in a Tarantino film. 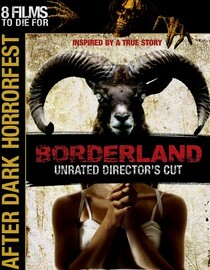 Anyway, tonight's movie is Borderland, which is based on true events of about twenty years ago. Three friends head to a border town on a road trip, and one of them is abducted to be sacrificed by a drug smuggling cult. His friends try to find and rescue him, only to find that the police are no help and that time is running out. Here's where I run into the conflict I mentioned above. This movie was brutal. The scenes of sacrifice and murder were intense and graphic. But I also remember when the actual cult killings in Matamoros came to light, and they were even worse and more terrifying. Just this year in Mexico, police have been beheaded, schoolchildren killed in cold blood, and many other people have simply vanished. I can't say that I liked this movie or was entertained by it, because even though it's a well made movie and a semi-fictionalized account, the reality is still happening around us and is even more awful. Even as I found myself thinking that, though, I still caught myself thinking, "Ugh, this is just like Turistas" or "Please, this is so cliched" before I reminded myself that the events of this movie did happen. Also, I have to admit a prejudice here. I don't have any good reason for this, but I just really hate Sean Astin (who plays a cult member in this movie) and his stupid fat face. Every good movie that he's been in, and there have been several (Goonies, Rudy, The Lord of the Rings Trilogy), I have liked in spite of him. I challenge you to look at his face in this picture and not imagine him saying, "Durrrrrr..."
Like I mentioned, the violence in this movie is intense and played for full effect. It does inject just enough of an element of suspense that you wonder how exactly it will play out. Despite the conflicts I mentioned above, I'm still going to give it three Palo Mayombe cauldrons out of five. Back to me. I would have cheered out loud if you'd linked your Sean Astin "this picture" to my Bruce Campbell-alike photo. But I still laughed aloud when I read "...but I just really hate...his stupid fat face." Well done. Aw, Will - I *love* your stupid fat face. Turistas was OK, but that doesn't mean I want to see it again with a different title!